This guy reminds me of Portal Three Kingdoms, which definitely tickles me. Surely I'm not the only one to whom it's occurred that they could retcon that set to take place in a region of Tarkir that bears an uncanny resemblance to Romance-era China? There are already plenty of elements of Tarkir inspired by Mongolian, Chinese, Indian, and Khmer mythology and literature . . . I'm so used to double strike being a feature of red or white creatures that like to attack that I didn't notice the most awesome part of Shu Yun's abilities: he doesn't need to attack himself. That means that there is a whole subset of removal that can't touch him, and your opponent can't afford to wait until he gets involved in combat to deal with him. I can think of a lot of spells that get pretty insane when you increase their mana cost by two and add "target creature gains double strike until end of turn". Act of Treason? Lightning Helix? Goryo's Vengeance? It's hard to think of a wrong choice, really. 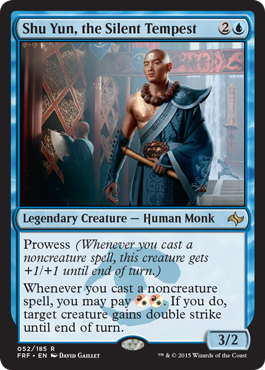 Welcome back readers todays card of the day is Shu Yun, The Silent Tempest a legendary human monk with a lot of prowess in combat. At its core a 3/2 with Prowess for three is solid and the ability to give any creature double strike could be a beating. In standard I don't know if this card will see a lot of play in Jeskai decks with their overabundance of more powerful cards means this guy, who is not unplayable by any means may get left on the sidelines more often than not. Overshadowed by strong cards in modern it might fair slightly better, it could be put into a Kiln Fiend style deck as another way win condition but how viable that is its hard to say, I suspect some fringe play. In eternal formats I don't expect this card to do anything. In casual and multiplayer its interesting it can turn your instants into a lot of potential damage, it also has some small political applications as you can give Joe's creatures double strike if he attacks Ben. As one of the few Jeskai colored commanders available that also strongly influences its casual and multiplayer potential, that being said it has a lot of potential. In limited I feel this card is insane outside of combat, with enough spells you can safety pump it and attack but I like the idea of double strike on demand, so this is obviously good in prowess decks. Overall this guy has some fringe constructed applications and can be quite powerful in casual. Today's card of the day is Shu Yun, the Silent Tempest which is a three mana 3/2 Blue Legendary with whenever you cast a noncreature spell it gets +1/+1 until end of turn and you can pay two Red or White to give target creature Double Strike until end of turn. A 3/2 for three that gets pumped up for what Blue is perhaps best known for is certainly decent, though it is likely just one boost per turn. The paid effect is much better as a Double Strike 4/3 is a serious threat, but Blue and White both have many evasive targets to work with this as support. Overall this is a strong card for Azorius or Izzet and will likely see some play as endgame support in combat trick and evasive based build. In Limited this is a 3/2 for three with a pump effect which makes it an automatic inclusion for Blue in Sealed and definitely better with Red or White as the Double Strike option is a game-winner with an unblocked creature. In Booster it is a solid first pick that demands Red or White support to be fully realized. Imagine this scenario. You have Shu Yun on the battlefield. Your opponent has a blocker. You cast a kill spell to take out their blocker, and two red to give Shu Yun double strike. Prowess triggers, making him a 4/3, then he gets double strike, so you hit for 8 out of nowhere. This should be a common scenario if you have Shu Yun. Double strike is a powerful ability that can never be taken lightly. There are a lot of good prowess cards, and Jeskai colors have been very popular. Will this three-drop make its way into decks over the other cards? Jeskai colors are usually more about playing spells than attacking with creatures, and if they do attack with creatures, it's more likely a horde of tokens or other small creatures, so double strike doesn't have quite as bit an impact as it would in another color combination. For these reasons, I think Shu Yun is a good, but not a great card.